We have had another busy week, but thankfully no inpatient stays for this week. 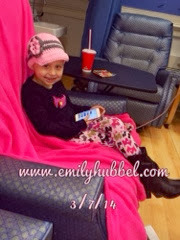 Emily had clinic this afternoon, and first time in a long time she didn't need any blood product transfusions. Everything is still low but not low enough to require anything. 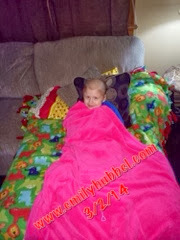 She is still neutropenic but hopefully by Friday when she has clinic again, she will be no longer be neutropenic. When she got there today her blood pressure was really high today. They gave her Hydralazine and checked her blood pressure every 15 minutes for hour and half and talked to nephrologist who requested that we up her dosage if enalapril. She has been getting headaches a lot which could be from how high blood pressures. Next week they want us to meet with the nephrologist but they think she has chronic kidney disease from long term chemo that we will probably have to deal with long term or it could be short term. Insurance doesn't cover the blood pressure machine for home so they told us signs that we need to look for. 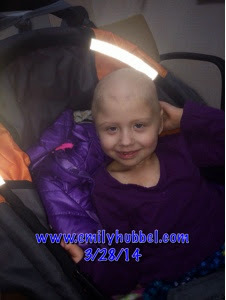 Other than that Emily seemed to be feeling so much better today and she is eating well. 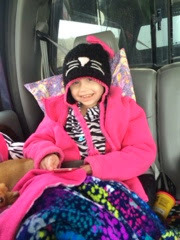 Emily had clinic today and it was an all day visit today. Emily is still having high blood pressure! Thank you to some wonderful people who sent Emily a blood pressure machine to be able to see what her blood pressure is. They know who they are and we thank you so much! All of her counts are starting to come back up slowly except her platelets took a big drop from Tuesday. We did learn that she was positive for ParvoVirus PCR (but that was taken over a week and a half ago now) which helped in her counts dropping to zero along with the chemo. We have no idea how she would get this but Dr Gowda says it's in the air and because she is immunosuppressed she could easily get it! So along with the chemo, her counts dropped a lot. He said they would normally give IVIG for that, which we did and antibiotics, which we did. I was worried wondering how do we know she is not still fighting it and he said that her counts are coming up, so we know she is past it. He said if her sister were to have it, they don't normally treat it, you have to let it pass. Today her ANC was 1100 so we are finally out of the danger Neutrapenic zone and only In the precautions of being careful. With that we are going to start her back on her two chemos. Dr Gowda did not want her to go on the thalidomide and Celebrex since it is supposed to drop your counts a lot and we didn't want to go back on full dose of the two she was on, so we are back to etoposide and cyclophosphamide! However instead of taking both of them everyday she will take 1 of them every other day. We are currently working with Dr Sholler to get Emily in soon for scans, bone marrow to get her on compassionate use of DFMO. 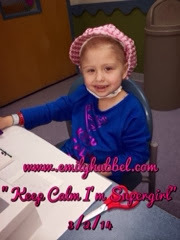 We really need to get Emily's bone marrow and platelets back up so that she can do other trials and platelets not be an issue. Julie, Dr Sholler's nurse, said she is working on it, so hopefully in a couple of weeks we will be on our way. 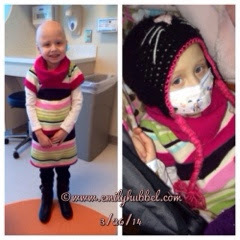 As long as Emily has no progression she will be able to go on the DFMO for a while! We are looking Into a trial that is Dr Lucas' trial so we are waiting to hear back! This trial we are hopeful we could do is in Boston at Dana Farber, but again have to wait to hear back. Today she did need to get platelets since they dropped so much. He again gave her 4 units since the one from this past Sunday lasted until today. 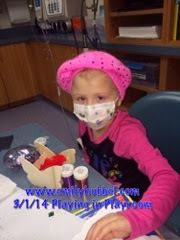 She continues to get Tylenol, Benadryl, Pepcid and solumedrol which have been helping in not having any reactions like she had before along with the platelets going slower. Thank goodness! Chemo. He called it Microangiopathy disease which is small blood vessels from treatment. So he changed her medicine to lisinopril and upped the dosage a bit to help with her blood pressure. So starting tomorrow (since she had received her morning dose this morning) she will start the pill which should should last for 24 hours where the liquid was much faster acting and not staying in her system as long. Tonight she will just get her other dose and no longer take the enalapril! We are hopefully her counts will continue to go up and she doesn't have to deal with the chemo side effects from doing them every other day. We are also hopeful to get her to Michigan soon so that we can get her on the DFMO and see her hair growing back and not seeing the nasty side effects she had! Please continue to keep Emily in your thoughts and love. And remember to hug and kiss your kids every night and tell them you love them! Last night was an extremely long night. I think I got about an hour of sleep total from watching her and keeping up with high blood pressures! The IVIG they check vitals every half hour and every hour hour increase if her body/vitals can handle it! They started at 8.5 and by 30 minutes she should have been able to go to 16.5 but during the first 15 she had a little high blood pressure so they keep it at 8.5 and then the next half hour checked it again and it was down a little bit. They went to 12.5 instead of 16.5 and she went up a little but not too high...next half hour tried to go to 16.5 but her blood pressure went up so they decided to put it back to 12.5 and leave it there and give her blood pressure medicine to bring it down. Overall the rest of the night she handled the transfusion well. It went for 11.5 hours at a very slow rate. It finished by 11 and then they checked counts. Port is still bring funny right now and still having a hard time getting the blood to draw but was able to get what she needed to send it off. Dr Lo came by this morning and said that she felt like at this point Emily didn't need to go home on any blood pressure meds but that she would follow her when we are clinic. She also reviewed her kidney ultra sound, bladder and that nothing was of concern but could tell where the tumor was removed that kidney was a little smaller but wasn't causing any problems! Remember yesterday her platelets were 23 and they gave 4 units last evening, after the draw today after IVIG they were 15. Crap what is going on. Hemoglobin dropped from 9 to 8.2, so hopefully she won't need blood again anytime soon. so they ordered pre medications and started those. Platelets came and they went to start them but checked vitals and Blood pressure was too high (146/96)to start platelets so they gave her hydralazine and after a little while blood pressure came down and she could start. The team did call Dr Lo and she would like for Emily to go home on enalapril. Taking a dose in the morning and in the evening and they are also checking with critical care to see if they can bring a blood pressure machine to the house. Platelets have now finished and blood pressure is up again now that done and they have redrawn labs to check to see where her counts are before they send her home tonight. As long as everything looks ok they will send her home on another medicine to the already other hundred that she is taking and keeping an eye on her blood pressure. So now we wait! Please continue to keep Emily in your thoughts and that we make home tonight with no other issues. And that everything looks ok to at least give her a break and she come back Tuesday! We are ready to get home to be with daddy and Jessie will be there tonight and Brianna is coming back from nanny's tonight. Emily is more than ready and wants to be home! Thank you Carla and Morgan for the shirt, Emily loves it!